"After half a century of space exploration we're now suddenly faced with what has long been a staple of science fiction -- an orbiting junkyard of cast-off space debris." With media headlines repeatedly warning us of debris falling from the skies, orbital debris, or "space junk," has finally risen to the forefront of social consciousness. But what is space junk? How did it get there? Just how big (and serious) is the problem? 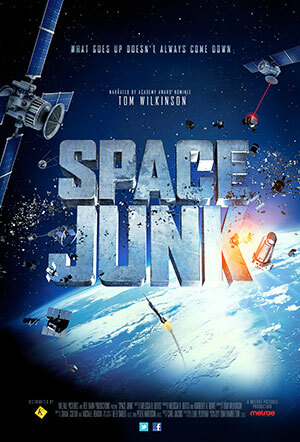 "Space Junk," narrated by Academy Award® Nominee Tom Wilkinson, is the first movie to explore the exponentially expanding ring of debris that threatens the safety of our planet's orbits. Harnessing the magical imagery the Full Dome Digital Theater, Director Melissa Butts takes us soaring -- from the stunning depths of Meteor Crater to an unprecedented view of our increasingly crowded orbits, 22,000 miles above earth. On-screen, Don Kessler, (ret.) Head of NASA's Orbital Debris Office and the "Father of Space Junk," reaches back to the beginning of our solar system for understanding and guides us through the challenges we face in protecting our orbits for the future. At risk is the future of space exploration and the safety of the extensive satellite network that powers our modern day communication systems. This visually explosive journey of discovery weighs the solutions aimed at restoring Earth's orbits. Stunning images transport the viewers by wrapping us in star fields and allowing us to witness massive collisions in space -- both natural and man-made -- as though we were in the center of the action.